Taimane is a musical force to be reckoned with. 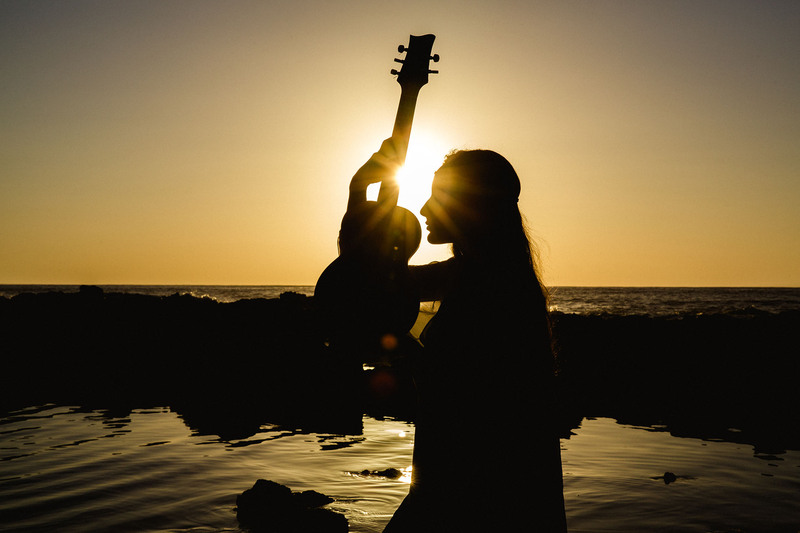 An international ukulele virtuoso who has been playing since the age of five, Taimane’s famed flamenco meets classic rock percussive style of playing impresses. A Hawaiian native from Oahu at only 28-years-old, she takes her and her music throughout the world. And in her live performance, that passion showed. Extremely sensual and expressive with her ukulele, it becomes easy to forget that all of those trebly high-pitched notes, melodies and thunderous riffs are coming out of that little ukulele slung around her waist. After an exciting show at The Mint in Los Angeles, CA last Wednesday, August 23 with her Hawaii Trio for one of eight headlining shows in her Californian Western Winds Tour, Taimane graciously sat down with me to talk about her playing, the island and what we can look forward to from the ukulele goddess herself. I’ve been doing the cheers in the past year which has been fun, because people love drinking and it’s a good way to include the crowd. So you blend all of these different elements into your ukulele–world music, percussion, flamenco. I follow a lot of different musicians and they don’t play the way that you do. How did you develop your style? Well, I’ve been playing since I was five, but I never really played Hawaiian music. I always played flamenco or classical rock type of music. It was just something that I connected to. And then the ukulele was my way to express myself. Did your parents grow up listening to a lot of rock and–? My dad showed Led Zeppelin and showed me classic rock. When I was 15 I was really into that type of music, so I kind of put myself into that type of music and learned it on the ukulele. How do you think the guitar and ukulele are different–because you were playing a little [guitar] tonight? Definitely! The guitar is a lot bigger and it’s great, but I almost feel isolated on it, just because it’s so big and I can’t really move around, whereas the ukulele I can move around with. It’s such a trebly kind of instrument that I can take a solo and people will know that it’s me because it’s just so high-pitched and trebly. I know that you are very expressive when you perform. How did your love for the stage come about? Honestly, I’ve always been like that. Even before I picked up the ukulele, I remember in my first ballet recital I was telling the girls, “Hey, this is how you dance.” I was telling them what to do and I remember there was a photoshoot after and I was all into it and loving it! I’ve always been really into the stage, so the ukulele has been like a tool for me when I’m onstage. I know Jake Shimabukuro was an early mentor to you. How did that come about and what do you think you’ve picked up from him? I met him when I was 8. I’m 28 now so–ooph–twenty years ago! My dad was my manager at the time and he met him. Oahu is such a small island so you come across everyone. I was learning ukulele and my dad found a ukulele teacher and he happened to be that guy. He was an amazing teacher, super mellow. He taught me a lot of technical stuff and technique, and is very showy when he plays too. I don’t take from his showmanship, I just kind of go with how I feel, but he was all about technique and learning music theory and was very cerebral about that stuff. So you released your last album We Are Made of Stars back in 2015, and now you have a new one coming this year. What can we expect from that? The last one was all about the planets and the solar system–you know Jupiter, Mars, Venus. This new one is all about the elements, so earth, wind, fire, water, ether, all of that type of stuff. I take a lot of my inspirations from nature, and living in Hawaii it’s hard not to. It’s hard not to take your inspiration from that. How is it performing in Hawaii versus the States? Being on the mainland, people are a lot more focused on what you’re doing because they’re there for a purpose. Where in Hawaii, I’m there every week so they’re more–what’s the word–relaxed? It’s nice to be on the mainland because they’re a lot more focused and have more of a drive to see you, and a lot more stoked! Keep up with everything Taimane and be sure to stay updated with her tour schedule at taimane.com. Whether you're sipping wine by the waterfront or sweltering under the summer heat in a jam-packed nightclub, you're sure to have a good time. Beautiful interview Rachael about a Beautiful Goddess.